I have been living in the UK since May 2007 and in London since Aug 2009. However, before 2009, I used to visit London almost every weekend to see my girl friend, now wife. She used to live in Hounslow West. So, I've been living in London since 2009 after I got married. Initially when I came to the UK on a work permit of 2 years, I didn't think I'd settle down here. I mean I liked UK starting from the first day itself. But most of my colleagues had decided to live in the UK for a few years and then return back to their countries and I was very much influenced by their thoughts. But after getting married, my wife tapped out my inner desire of settling down in the UK. She loved London to bits and so did I. At the time, we were renting a house in Hounslow West. We lived there for around 3 years and since my wife came to the UK before me and started living in that house before me, she lived there for 4 years. The rent of that house then was £1000 pcm. There were 3 rooms and a box room in it. So, we divided the rent between the 4 of us and paid the rent for 3 years. In July 2012, I and my wife moved to Feltham in a 1 bed studio flat with a garden ! We paid £850 pcm there and lived there for 6 months. One major problem for me living in west London was wasting a lot of time while travelling to work. It used to take about 1.5 hours from my house door to my workplace, which was in Liverpool Street, central London. So after 6 months of living in Feltham and after having a bad experience with the land lord in terms of getting back the deposit, we moved to Ilford. Ilford had many pros and cons. One of the best things about Ilford was that it used to take me just 40 minutes from my new house door till my work place. So, I saved 1.5 hours per day in comparison with the time I used to spend in travelling from West London. Having said that I feel West London is more greener, cleaner, calmer and safer than East London; Nevertheless I decided to live there for some more time. There are many good things about Ilford too. After living there for a while and keeping in mind that I had already cleared the house loan of the property I purchased back home in the country where I originally come from and the fact that I had saved some money over the time, I decided its time to buy a property rather than paying rent. As some one rightly said about paying rent, "I don't believe in paying some else's mortgage !" 1. How far is the property from the bus/train stop / Station. 3. Do fast trains stop at your station ? 4. Primary / secondary schools near by ? 5. Shops near by ? 6. Maintenance charges per month (for flats) ? 7. Freehold or leasehold. Usually leasehold is applicable for flats. Preferably the remaining lease should be over 90 to 100 years. 7. How old is the building ? 8. Any repairs required ? One weird thing about my property buying experience is that I selected and bought my property after just 2 viewings or you could say after almost 3 viewings. I liked the first flat that I viewed very much. It was near Chadwell Heath station. It was on the right side of the railway track, if going towards Shenfield. My manager advised me not to go for properties which were on the right side of the track as a place called Dagenham falls there which apparently is quite rough. When I went to view the flat in Pedley road, I found it nice, clean and peaceful. The flat was very clean and very well furnished. One of the reasons for not buying it was the fact that the lease remaining on it was just about 70 years. Some of my friends suggested that it's always advised to buy flats having lease more than 100 years. The next property that I viewed was just in the next lane, Crystal place. The structure of this flat was very similar to the one I viewed before viewing this. But this one was not as nicely maintained as the earlier one. By the way the 1st one was for £145000 and this one was for £126000 for obvious reasons. I liked the first one so much that I tried to ask the agency to request the owner to extend its lease. However the agency said that it would take a lot of time. However, interestingly, the agency got back to me after a week or so to let me know that the actual lease on the flat was more than 100 years ! It was too late by then, however. My next appointment was to view a 2 bed flat somewhere in Romford. I got very late for that appointment as it was just 30 minutes after the start time of the previous appointment. So, it got cancelled. Hence I'd advice you to book appointments with sufficient time gap in between them. One of my colleagues who bought a 2 bed flat about a year ago told me that he took 6 months to find and buy his property. However it is not necessary that I take the same time. I just had to make sure the details corresponding to the above mentioned 13 points are satisfied. So, even if I find a house within a week's time but it satisfies all the points, I shouldn’t hesitate to make an offer on it. My manager, who was also looking to buy a house, and a mortgage consultant suggested me that if I am eligible to get more mortgage from the lender, it is always good to buy a house than a flat. It made me think a lot as my wife also preferred a house than a flat and I was eligible to get a higher mortgage. So now I started to look for houses as well. It was just after a few days that I saw this house in Ilford near the place I was currently living. It was for £185000. It satisfied all points mentioned above. Regarding checking crime rate, I didn’t explicitly check it online (for example here - http://www.crime-statistics.co.uk/postcode/). When I went to view it with the agent, another guy came to view it with his mum. I came to know later that he had come to view it for the 2nd time to show it to his mother. They seemed to have liked the house as well. So, I decided to call the agent and make an offer on it. I decided to make an offer of £175000. Before that I thought I should speak with him and he said there will be no use making an offer that is considerably less than the asking price. He said, in fact, the seller is not ready to accept even a penny less than the asking price ! Listening to that made me rethink about my offer price but I still decided to make an offer of £180000. The next day, I found out that it was declined. After getting a few hints from the agent, I made an offer of £184500 which was accepted, finally. The next thing I did was to immediately book a mortgage appointment with my to be lender, HSBC. I got an appointment after about a week and the mortgage Manager took my details. Since I'm self employed, he needed last 2 years accounts or last 2 year's SA302 forms. He took other basic details. He also gave me various repayment options and helped me decide one. I went for the option where I'd have to pay the lowest repayment amount. I went for capital repayment where the repayments would go towards the mortgage amount as well as the interest. However, during the initial phase most of the monthly payment amount goes in interest. He gave me the next appointment after a few days before which the underwriters would decide whether or not I'll be given a mortgage. In the next appointment he explained me about building insurance and non critical disease insurance and helped me decide an option. He took my signatures on various documents and gave one signed copy to me. I chose the option where for the first 2 years the rate of interest would remain constant and which would be £3.84. For a mortgage of £154000, the monthly payment was calculated to be around £723. He said the underwriters are still working and need some more time but don't worry it will be approved. I was quite happy and enjoyed the rest of the day and the weekend. The agent was always in contact with me advising what to do next and was getting latest updates from me, probably because he had the pressure of selling the house as quickly as possible. He suggested me a solicitor and I went to meet him. 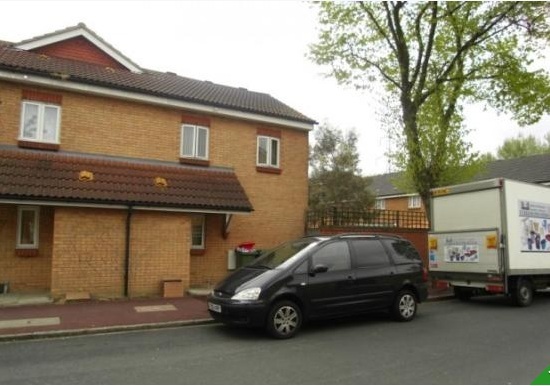 Now, I knew that there was a deal done on this property a few months ago but it was cancelled by the buyer as he was disappointed by the fact that the tenants living there would not move out because of the fact that the new place where they were going to move was not vacated ! However, when I went to meet the solicitor he gave me a slightly different story. He said, the fact is that the tenants could not move out because, they want to be forced out of the house via a court order. I'm not sure of the exact reason for this. But probably its because, if they are forcibly removed out of the house using a court order, then they can get a council house to live in, apparently ! I was worried after listening to this fact. The solicitor then said, don't worry as he can add a clause in the contract mentioning that if the tenants are not out by the already decided date, the whole deal will be cancelled and I will get all my money back. I thought that’s good enough. My agent also suggested me to ask the solicitor to give me a 50% discount on the searches as they were already done recently. The new searches cost about £300. By the way, the HSBC mortgage advisor also mentioned that the solicitor should be CQC registered else, the bank will charge £192 extra. In my case, the solicitor was not CQC registered, but I still chose him as he had worked on the property before in the deal that got cancelled and hence would do his activities quickly. After about a week I got a call from the bank and the mortgage advisor said he some good news and some bad news. He said the good news is that the underwriters have approved the mortgage and the bad news is that they can't give mortgage on whole of the requested amount, which is £154500 but can lend £147600. I was very disappointed and told him, I'll think and let him know. I had about £10000 back up for solicitor fees, survey, stamp duty etc and the rest was just backup. My wife suggested rather than keeping money with you in your account, it is always good to give as much deposit as possible as that would reduce the monthly payments and moreover the agent and confirmed that I wouldn't have to pay the deposit immediately. Only 10% of the amount needed to be paid after the solicitor finished his work and the rest after about 1 to 2 weeks after that. Moreover my salary day was not far away, so I thought of accepting HSBC's offer. The day after the mortgage was sanctioned, I received a text from "Direct Val". It read "We have been requested by HSBC Bank plc to arrange your valuation. Please call us on 08453051611. Quoting reference xxxxxx as we are keen to complete your application. Lines open 9am - 8pm mon - Thurs, 9am - 6pm Fri.". I called them up and the person on the phone took some basic details from me and said that there will be a survey done on the property from the Bank's side and I will have to do a survey on the property too. He asked if I would like to appoint them to do the survey. He gave me 3 different options. I chose the 3rd and most advanced option which included a structural survey. Its price was £400 including vat. I made the payment on the phone by providing my card details. He said both the surveys will be don within 3 to 5 days and the final report will be sent to me and HSBC. Update on 27th Feb 2013 - I called "Direct Val" surveyors a couple of times since a few days and they say that the next appointment for an advanced structural survey would be survey 18th March. They also agree that this is very late and that they will try their best to get an early appointment. However, nothing has happened yet. I also asked them if this delay is caused due to my upgradation of the type of survey, i.e from basic to advanced ? And they said, they would check and let me know within 30 minutes. But no one has come back to me. They seem genuine but can't do much as they are not able to find an appointment. In the meanwhile my agent has also been chasing me to get an appointment from them. Update on 1st March 2013 - I called Direct Val property surveyors at about 10 AM and they promised to call back by 2 PM. No one called. I phoned them at about 3:30 when the same guy told me that they managed an early appointment which would be on 7th March. He said that he understands that it is still late. I requested them to try to make it earlier than 7th. They said they will try. Finally I told this to my frustrated agent. He was still upset and requested me to ask the surveyors to call the agent right away to book an appointment. I did the same and the surveyors agreed. I hope they called the agent and booked an appointment on the 7th. Update on 5th March 2013 - I received an email from my Solicitor requesting me to meet his junior trainee solicitor. I then received an email from the trainee solicitor asking me to get an ID proof and 2 address proofs and the bank statements showing funds from where I would be paying my deposit and he also wanted to know the original source of those funds. In my case my case the sole source is the savings from my salary. I met him and he scanned the documents that I got. I got my passport, ILR visa biometric card, 1 personal bank statement and 1 business statement. He showed me the contract document. I didn't sign anything but saw that one of the sections in the contract doc showed me all the things that were included and excluded in and from the property. I noticed that the seller was going to take back most of the furniture with him. I transferred £300 as an initial part payment to the solicitor as a bank transfer. Update on 3rd June 2013 – I haven't still moved into my home ! The tenants finally moved out on 15th May, though. The solicitors were not very efficient, though they have already worked on a case regarding the same property. The bank requires a flood report which is an additional search and will cost £70 inclusive VAT. The bank also required an indemnity insurance policy in respect of a building completion certificate for the build which the seller says is unavailable. Normally the responsibility for providing and bearing costs of such a policy is on the seller however they have confirmed that I should bear this at our own cost. The seller's solicitor is required to provide an undertaking to the bank however they are adamant that I pay their fee for such an undertaking which is £75.00 plus VAT. After sorting everything out, the lender's solicitor has come back saying the undertaking has spelling mistakes, he had also raised issues about land contamination! Well, just today my solicitor confirmed that all the documents related to the above matters have been submitted to the bank. We are now waiting for the banks reply. I hope they don't come back with new issues. By the way, since my solicitors were not replying to my emails and phone calls very promptly and were proceeding very slowly, I warned them about me registering a complaint against them here - Solicitors Regulation Authority and then Legal Ombudsman. After this warning,I immediately received a long apology email and they started working promptly after that ! Update on 4th June 2013 – We were hoping that the lender's solicitor gives a green signal and releases the funds. But he asked my solicitor to make the building's insurance company aware about the land contamination issue. When I called the building's insurance company to make them aware, they asked me to email all the documents related to land contamination to pertcut@aviva.co.uk along with my insurance number. I asked my solicitor to do the same, which he did quickly. He also said that the lender's solicitor requires £192 to do land registry and another £190 for something that I don't quite remember. So, I transferred £382 to him. He would pay the lender's solicitor tomorrow morning. Update on 7th June 2013 - I called my insurance company to tell them I was awaiting their reply to the email which I sent to pertcut@aviva.co.uk. They said, they had sent a letter to the property I had bought. I requested them to send the letter to my current address. But it was impossible for them to do so, as they could only mail to the address which was listed in the building's policy. They were quite surprised when I said I didn't have access to the building. They said you can't buy a building's policy unless the house contract is signed ! I was quite disappointed with my solicitor who didn’t tell me about this. In fact he told me that until and unless I get a building's insurance, things won't move forward. I requested the insurance guys to email me a copy of the letter. Which I emailed to my solicitor and they emailed it to the lender's solicitor. We were again hoping that the lender's solicitor does not come back to us with some new issue. But alas, he did ! He said that the insurance didn't cover land contamination. For which we replied we have got an indemnity cover for that. But he said that the indemnity cover also does not cover all the things. So, my solicitor got a letter from the authority who undertook the environmental checks, mentioning that they were aware of the fact that the environmental checks failed. I don't know how this would help. But my solicitor tells me that this would help and that the lender's solicitor should take things forward after reading the letter. Update on 11th June 2013 - Today, finally, We received in a response from the bank that they are are happy to proceed in this matter. The lender's solicitor now needs confirmation from the Sellers Lawyers that the four points of understanding in the Indemnity Policy for the contaminated land are satisfied? They also require an up-to-date Bankruptcy search as the one previously provided expired on the 4th June. Subject to the above the lender's solicitor confirmed that their pre-exchange and pre-completion requirements will be satisfied, and they look forward to receiving our anticipated completion date in advance so that they may request funds from their client (the bank). Update on 12th June 2013 - Today my solicitor received the following email from the lender's solicitor: " We confirm our pre-exchange and pre-completion requirements are now satisfied. We look forward to receiving your anticipated completion dates in advance so that we may request funds from our client." My solicitor asked me to consult with my agent and let him know the date when we would like to exchange contracts and do the completion. My agent suggested to exchange the contract as soon as possible and to do the completion within the next few days. But when I phoned my solicitor the same he advised me to do the exchange of contract and the completion on the same day. He said this would be beneficial for me as if the exchange of contract was done before the completion and if the bank comes up with some issue after the exchange of contract, the completion might get delayed. And if the seller issues a notice of completion and if the completion is not done before this notice, which is 10 days, then after 10 days of the issue of notice, I will have to pay off the whole deposit. Hence I decided to do the exchange of contract and the completion on the same day (on Friday, hopefully). Update on 14th June 2013 (Friday) – I have finally received the instruction from my solicitor to transfer the deposit, solicitor's fee, stamp duty and costs for other bits. 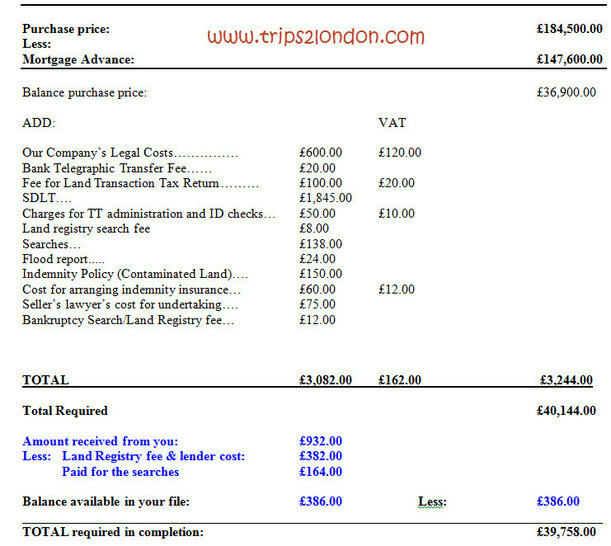 My deposit was £36900 and including the other costs I had to pay a total of £39758. I transferred £10000 before midnight from my business account to my personal account. The next £10000 I transferred after midnight. My personal account already contained about £15000. So I was falling short of about £5000 which I requested the bank that held my account to transfer from my business account into my personal account. After that was done I requested them to do a CHAPS transfer. They did a transfer which went through within about 1 hour I presume. They deducted £30 from my account for the CHAPS payment. I informed about the transfer to my solicitor and agent. My solicitor said he will provide me with all the relevant documents within 2 to 3 weeks. He also asked me to collect the house keys from my Agent. My agent congratulated me as well and requested me to come down to his office to collect the keys. He also told me that the initial token money of £500 will be refunded within 2 to 3 days. I couldn't go to his office to collect the house keys today but will fetch them from him tomorrow morning!